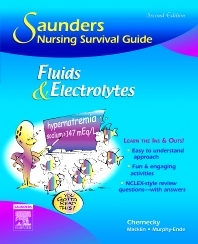 Saunders Nursing Survival Guide: Fluid and Electrolytes, 2nd Edition presents a complete review of the ever-challenging topic of fluid and electrolytes, using lighthearted cartoons and mnemonic tools designed to make your learning experience more relaxed and enjoyable. Each book in the unique Saunders Nursing Survival Guides series features brief, focused material and lively illustrations that make complex subjects approachable and easy to understand. Consistent unit headings - What You Will Learn, What It Is, What You Need to Know, What You Do, and Do You Understand? - break information into manageable sections to make learning easier. Each chapter also includes a number of NCLEX® Exam-style review questions to reinforce important information and help you prepare for the examination as well as future clinical applications.